You have the power to make the owlaps project bigger, better! Support us making the best trail videos ever. Only you can send us on the road to video-map the entire trail network! You are about to do something good! Thank you! You want to know a little bit more first? Here it goes! There is plenty of reason to support the owlaps project! Maybe you're a Youtube subscriber and you watch (almost) all our videos? You want us to continue the work we are doing? You want us to explore and preview more trails? You're a mountain bike passionate? 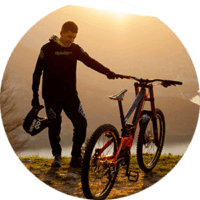 As you might guess, riding, filming, editing, developing the website, communication, deal with partners, ambassadors, answer your questions take a looot of time! Supporting owlaps is a way to encourage us and especially, give us the possibility to continue the work we are delivering to you! And make it even better! If you're reading this. You kinda already support us, because you're interested in what we are doing! Thanks dude! To push it a little bit further and give us an helping hand in our journey, you can become a "patron". Patrons are people/ fans who support creators and projects they love. By giving them a small amount of money (you decide!) each month, they give projects life and get rewards for that. We release about 3 trail videos a week, if you consider supporting the project with 2$ a month, it's like 0,16¢ a video! Worth it! You can also support us by checking out products in our shop, or simply continue to watch, comment and share our trail videos! Do you want to see the owlaps project continue forever?! 1/ How does Patreon work? Patreon enables fans to support creators and projects they love and want to see growing. You can choose from different monthly support levels and get rewards for it! Obviously, it is not mandatory and you can unsubscribe at any time! 2/ What do you get in exchange? First, our gratitude! Honestly, you enter the game and encourage us doing what we do. That's awesome! But you also enter the patrons private circle! You'll get access to exclusive content and different giveaways according to the support level you choose. 3/ How do we use the money? The money is used to continue and grow the owlaps project! It pays the website fees, helps us on travel budget, video setup and small bike repairs! We'd love to hire a video editor and a web developer at some point! It will give Vincent and owlaps ambassadors more time to ride, which means more videos! 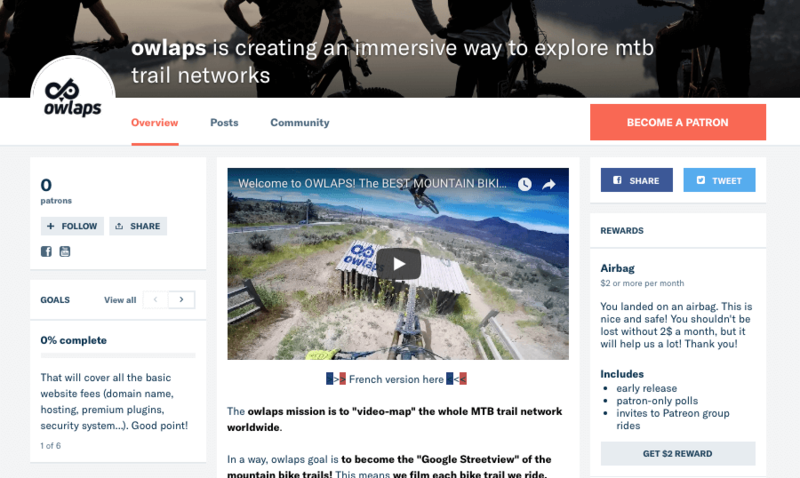 Support the owlaps project now! Do you want to see the owlaps project continue and grow? With more trail videos each week?